This is the best vegetarian chili recipe we've ever eaten, and it's one we enjoy quite often. If super simple is what you're looking for and you want it done in 45 minutes or less, this hearty veggie chili is the perfect recipe. This dish is completely meatless, full of protein, low in fat and packed with nutritional goodness. You can make it with fresh or frozen vegetables too which makes it budget friendly. For the sake of keeping it quick and super easy, I generally use fresh chopped onion and zucchini, a tasty mix of frozen vegetables and canned beans and tomatoes. If you decided to use quinoa, combine 1/2 c with about 1 cup of water and cook over medium heat until the water is completely absorbed. Spray the bottom of a large pot with cooking oil and heat over medium heat. Throw in your chopped onion and cook until they are tender and slightly browned. Add the carrots, zucchini, green peppers, red peppers and garlic. Adjust the heat if necessary and cook until the vegetables are nice and tender. 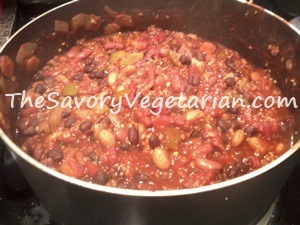 Add in the tomatoes, beans, seasonings and quinoa and bring to a boil. Once boiling, reduce the heat and simmer on low for about 30-35 minutes. I had to change up this recipe a bit, since I have changed up the way I make it. 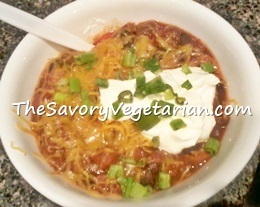 Instead of using chili beans, I swapped them out for black beans, kidney beans and pinto beans and I added some extra chunky veggies to the mix. Absolutely delicious. One bite of this and no one will care that it doesn't have meat in it. Most people look at me like I'm growing horns when I tell them that I love vegetarian chili because most people think that the meat makes the dish. But chili is much more than a bowl of meat in the end. It's the perfect blend of seasonings and thick hearty ingredients. If you're looking for a quick and easy, dinner-time meal for you and your family to enjoy, this is the best vegetarian chili recipe, ever! Vegetarian Frito Chili Pie - Served over fritos and topped with cheese and sour cream for a delectable vegetarian frito chili pie. Who doesn't love a good old American favorite? This is an especially good choice if you have picky eaters in your household. They'll gobble this right up, guaranteed. Traditional Vegetarian Chili Meal - Serve it with a nice, warm piece of corn bread or with some of your favorite crackers and top it with your favorite chili toppings. So delicious you won't even miss the meat. Need I say more? Best Vegetarian Chili Burgers - top your favorite veggie burger with a scoop of this and put a vegged out spin on an American classic, the chili burger! This is one of the best ways to dress up a vegetarian burger recipe. Absolutely divine. 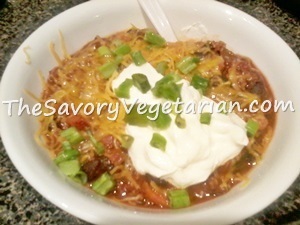 Ultimate Vegetarian Nachos - This is the best vegetarian chili recipe to make nachos with. Layer it over your favorite tortilla chips, pour on a bit of queso and top with lettuce, tomatoes, sour cream and guacamole. It's one of our absolute favorite ways to eat leftovers. It's quick and simple, and it never gets old.